could go as far as a half-time occupation over a three-to-five week period for major key accounts) will likely fall under the "time-waster" category, whereas those who accept it have greater chances to see a high Return on Time invested. Situational Analysis can be broken down into four parts: 1) the customer and its own strategy, 2) its needs, expectations, purchasing strategy and processes, 3) your (supplier's) history with the account and 4) the competition you (as a supplier) face towards this account. 1.2. Strategy fomulation - "Where do we want to go?" A key difference here with Sales Management is that KA Management addresses not only the needs of the customer, but its strategic goals. Hence, "helping the customer in achieving its own strategy" is central in this task, all the more as only customers with clear strategies will generally qualify for being a Key Accounts! However, few companies differentiate Strategy from Action Plans. This makes another big difference between time wasters and successful KAM players. It takes disciplined team thinking and creative processes, starting with the identification of the "situational potential", and translating it into a well-grounded "strategic orientation" in turn leading to winning "strategic" and "operational objectives", eventually expressed in a "KA Vision" and "Mission". 1.3. Operations - How do we get there?" As many seasoned professional well know, “everything lies in the execution” or, said differently “a well-executed B-grade strategy will beat a poorly executed A-grade strategy”. Without turning down A-grade strategies, this emphasizes the importance of rigorously following action plans. This is where the KAM must show his/her Leadership and Management skills (see below). 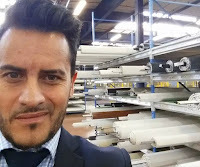 Only then can the supporting teams enter into action, under the leadership of the Key Account Manager. 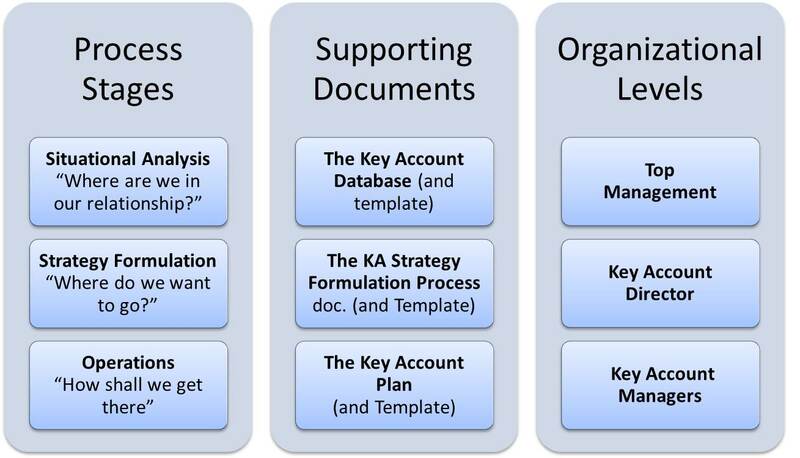 Every organization has its own way of organizing the KAP processes but, from our experience, three typical support documents seem to make a very useful triptych for the KAM. Note that it is the responsibility of the KA Director to validate this tools and to set up the degree of conformity to it for all KAMs. Of course, such support documents do not include all the supporting tools such as ERPs, CRM and the likes, deemed necessary for a full-fledged KA organization. These documents can be fruitfully described as follows. This document is quite personal to the Key Account Manager. It typically starts from a template in Word format, adapted and validated by the Key Account Director, potentially completed by an Excel-type document, but keeping the basic structure in the four parts described above. It is the place where all the strategic information about the relationship can be stored and updated, wih the help of different members from inside and outside the company. This document, which can be developed in Powerpoint format, walks the KAM and his/her team through a methodological and systematic track to ensure enough depth in thoughts and creativity. In the version we have developed, it comprises matrix tools to reach a sound "Strategic orientation" and a series of imbedded objectives from the most general "Strategic objectives" down to "Supporting operational objectives" and eventually "Action programs" and "Action plans" which should be of two complementary types: "Contractual" and "Relational". KAMs and teams can then complete the formulation process with their "Vision" and "Mission" for the relationship development. As said above, the KA Plan is the final deliverable document of the KAP process. Generally regularly updated (following the concept of "sliding plan"), it is a strategic planning document, not a reporting one! Before anything else, this tool should help the KAM communicate with the KA team about the relationship with the customer and monitor the action programs over time. Key Account Management, far too often, has merely been understood as a "Sales Plus" orientation. Companies which take it as such (going as far in this "sin" as only replacing "Sales" business cards by "KAM" ones!) are definitely bound to waste time in this game. Indeed, the Key Account orientation for an organization is a typical, full-fledged, Change Management challenge. As such, it must involve all its managerial layers, from top management to KAMs and their teams (not forgetting Sales, of course) for reconsidering the roles of all actors. Three typical levels should be involved. Often nicknamed "C-level", top management is of primary importance in supporting the whole transitional processes. 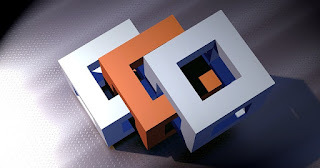 It must ensure the alignment of the entire program with the corporate strategy,. It must also secure a high quality internal environment, especially the selection of specific investments (people, supporting tools), and strongly support the development of a true "KA culture", encouraging the teams, and being active in the concrete relationship management with customers, for example through the organization of an Executive Sponsorship scheme. In charge of the whole KA Program, under the control of Top Management, the KAD is often the initiator of this program. 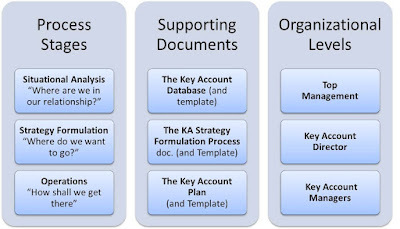 Its mission includes (but is not limited to) ensuring organizational congruence (making sure that all organizational levels and functions act in good synergy and harmony), building up and validating the tools and processes involed in managing KAs, including KA identification, selection and segmentation, human resource processes in collaboration with the HR department, and all tools and processes necessary for KAP. The KAD must manage potential conflicts, identify best practices and ensure continuous improvement. KAMs, needless to say, must have very good sales skills. However, they should have additional skills and a specific mindset which actually makes them very special resources, rather rare and hard to recruit for HR services. Specifically, a good KAM is a good Manager because he/she manages many projects with different groups forming the KA Team. He/she is a good Leader because he/she carries the responsibility of the decisions leading to a developing relationship with every KA in charge. Last, he/she is a good Strategist in that his/her activity is very similar to that of a BU Vice-President, i.e. drawing a sound strategy over several years, generally the three years ahead. In a speedy and demanding environment, the executive's mind is quite understandably often in search of simple, easy-to-remember, yet powerful representations of reality with the related opportunities and challenges. Hopefully, the simple representation of the KAP's dimensions proposed here will outline the critical points to be tackled at the different levels of the organization before the absence of positive outcomes may be charged to KA Management itself, for lack of collective behavioral and execution requirement understanding.